We ask that visitors using wheelchairs please ask our staff for assistance as needed. Ramps are installed within Saga and Kameoka Torokko Stations, but a staff member will use a portable ramp to help you onto the train. There are also elevators at Kameoka torokko station. Slopes (ramps) are available at our stations for improved mobility. 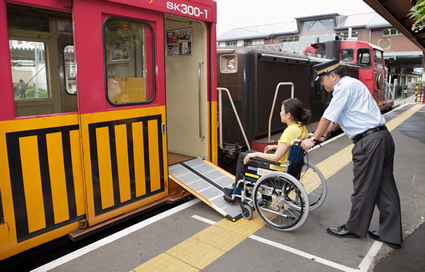 Portable ramps are kept at stations so that visitors using wheelchairs can quickly and easily board and exit the trains. Braille blocks are installed on the platform. Braille signage can also be found throughout the stations. 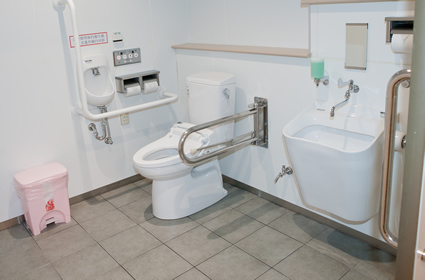 We also have an accessible toilet with features to make visits more comfortable for the elderly, visitors with disabilities, and expecting mothers. At Arashiyama torokko station, there is a 60-step staircase connecting the station and platform. 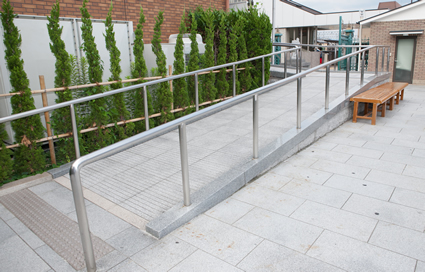 Should you need a ramp for assistance, please use Saga torokko station instead.